Perhaps the most scenic drive in the Keweenaw Peninsula is the loop between Eagle River and Copper Harbor formed by Michigan Highway 26 and US Highway 41. 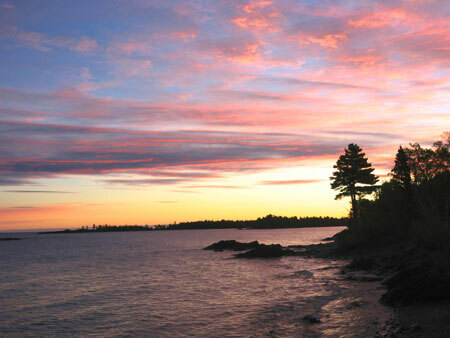 A fall sunset at a shoreline pull-off along Lake Shore Drive (Hwy 26) between Eagle Harbor and Copper Harbor. One of our favorite stops between Eagle River and Eagle Harbor. The brothers of the Holy Transfiguration Skete, near Jacobs Creek Falls, operate the fantastic Jampot bakery and jam store full of tasty delights made by the brothers. 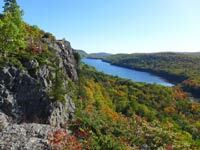 A fall hike at Copper Harbor. The entrance to the Hunters Point hiking trail. Far Right. Jo takes a break at tip of Hunters Point. Copper Harbor is in the background. Some fall scenery near Copper Harbor along Hwy 26 between Eagle Harbor and Copper Harbor and along US Highway 41 south of Copper Harbor. PHotos courtesy of Tim Zheng. 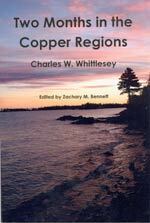 Our fall color report pages for past history and current reports on when to expect peak color in the Keweenaw and Western Upper Peninsula.